When you were a kid, you probably collected something you loved. Maybe it was baseball cards or Star Wars action figures. Since I was five years old, there has been only one thing on my mind: Soccer. When I am not playing soccer, watching it, or writing about it, I can be found collecting items related to soccer. Why? Because it is not enough for me to just enjoy the beautiful game. I want a piece of it. I have collected soccer jerseys since my dad bought me my first one in kindergarten—a Barcelona Messi jersey. Since then I have expanded my collection by saving up money or receiving jerseys as gifts. They include jerseys from La Liga, Premier League, Serie A, Bundesliga, Ligue 1, and of course, MLS. I have also collected national team jerseys including South Africa, Ghana, Mexico, Argentina, Sweden, Egypt, Hungary, Chile, and Kenya – all countries that someone I know has visited. Each jersey is different. For example, Mexican jerseys have so many sponsors they look like cars covered in bumper stickers. The jerseys can also have sponsors that I like such as Angry Birds for Everton and X-Box for the Seattle Sounders. It is especially exciting when limited edition jerseys are released, such as the 4th of July Union jersey or the retro Bethlehem Steel jersey. It is fun to have it customized with your favorite player’s name and number. One time, I was able to get a signed Sebastian Giovinco jersey, which was fabulous, since he is one of my favorite players in the league. What I like about collecting jerseys is that each year the jerseys change and there is always more to search for. Like jerseys, there are so many soccer balls to collect. I prefer to collect mini soccer balls. I currently have 35. They are all unique. 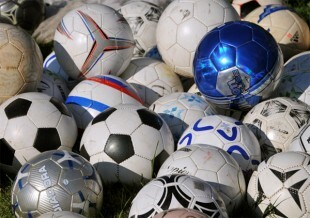 Some are club balls, while others are from tournaments such as the FIFA World Cup or the Gold Cup. Others are replica balls from leagues around the world. Many of them remind me of a special memory I have, such as the time I went to the franchise opening game of NYCFC at Yankee Stadium or the time I traveled to RFK Stadium to see the Union play again DC United. Jerseys and mini-balls are great, but my favorite items to collect are soccer cards and stickers. I started collecting Panini FIFA World Cup Stickers for the 2014 World Cup. It became an obsession. In order to complete the collection, I traded stickers with people from all around the world (on trading websites) until the entire sticker book was filled. I look forward to doing the same for the upcoming FIFA World Cup 2018 tournament. I also collect various soccer cards such as Topps Match Attax from the Premier and Champions Leagues. I like to use my allowance to purchase packets from YSC after my soccer games. I also collect MLS soccer cards and always make sure I have a complete set of the Union. With all the bad things that are currently happening with the Union, collecting is something that I can focus on. Through collecting soccer jerseys, soccer balls, and soccer cards, I am able to make up games where a ball, a jersey, or a card represents a team. In my imaginary world, I create my own table and my own league. I give each team some players, and if they win the league by the end of the season, they get to pick other players. It’s almost like a video game. I create teams that are better than in real life. My imagined Union team would include the greats of Messi, the Brazilian Ronaldo, George Best, Franz Beckenbauer, Pele, and the Maestro Diego Maradona. It would also include Mohammad Salah, Manuel Neuer, Neymar, Cristiano Ronaldo, and the soccer protégée, twelve-year-old, Benjamin Brecher. In my world of collecting, the Union are actually doing well. And this makes me feel better. Thanks for this article. I have collected jerseys as well. From all over my travels as well as family and friends. My favorite that I got myself is most likely the Thai National Team from early 2000. Took me all day to find it in Bangkok. One of the coolest overall is FK Lushnja from Albania that a friend got me. Huge octopus on it. I also have a bunch of scarves including a Leicester City one from Kasey Keller days. Cool: I have scarves too but not that many! Good work, Benjamin. Like the idea of collecting mini balls. One of my son’s prized possessions is a mini Union Adidas ball signed by Sebastian LeToux. Great article Ben!! Well done. I have a ten year-old son who also collects soccer cards and he likes to make up his own teams with them as well. I hope he keeps doing that! My two favorites in my jersey collection are FC Metz from France and San Benedetto del Tronto from Italy. Another great read young man! One day you will have some great memories to share with your own kids! My daughter brought me a Roma scarf from her study abroad in Italy. My son is going to Germany for a study abroad. Hoping for anything he can get his hands on! Keep up the fine work! Very well done, keep up your soccer interests, and the article was most interesting! !